Paramount in the food and beverage producing industry is the safety, quality and regulatory standards for all products, ingredients and packaging. For Nestlé, a major food and beverage producer, setting standards higher than the US Food & Drug Administration is required to exceed the expectations of their customers. Nestlé, which employs more than 330,000 people worldwide works closely with their packaging and ingredient suppliers to ensure that stringent quality and food safety guidelines are followed. The process begins with a highly coordinated transport and delivery procedure ensuring quality and safety of supplier ingredients prior to production. Once the ingredients arrive at Nestlé’s manufacturing locations, they are inspected with great care before being approved and accepted into Nestlé’s facilities. Nestlé believes that in order to provide consumers with healthy products you must begin with healthy ingredients. In an effort to do so while also continuously improving product design, Nestlé utilizes government and internally developed standards.These efforts lead to new innovations and the upmost in healthy products. Nestlé’s strict criteria guide all product development and are based on the research and recommendations of the American Academy of Pediatrics, American Heart Association, Food and Drug Administration, United States Department of Agriculture, and the National Academy of Science Institute of Medicine. In order to meet with Nestlé’s high standards for safety, a superior pumping solution was needed to pump both caustic and acidic wastewater laden with solids, including those containing fibers and fats. In the early stages of production ingredients are washed before being sent to various production and preparation areas. The remaining wastewater must be pumped away and disposed of efficiently while also adhering to strict environmental rules and regulations. For one Nestlé manufacturing plant in the northern United States, ensuring environmental safety measures means carefully maintaining several waste streams involved in the plant’s manufacturing process. Minimal Footprint and Self Priming – Using vertical wet pit cantilever shaft sump pumps or dry mount self-priming pumps would take up too much floor space but the need for reliable priming remained. Submersible pumps are inherently self-priming and kept cooler by being submerged in the liquid being pumped. Non-Clog Design – As the various solids settle-out they would tend to clog pumping action. Reliability – Positioned at the bottom of deep sumps, the pumps would cause operational delays if they needed to be constantly pulled for clogging, inspection or maintenance. Since caustic and acidic solutions were present in the wastewater sumps, superior pump construction was imperative. Kerr recommended BJM Pump’s SKX75CSS stainless steel submersible pump, a high grade of cast 316 stainless steel. The plant also needed to have redundancy and back-up within this particular sump in order to control costly down time. As a solution, Kerr recommended that three pumps be installed in the application. The triplex lift station is a blend of three pumps operating in parallel. Choosing the three BJM SKX75CSS increased the reliability in the system and efficiently covered a wider range of operating conditions. Inherent within the triplex control is the ability to operate one, two or all three pumps at the same time allowing for the changing rate of inflow to the sump. Furthermore, the pumps can alternate in a lead/lag position to promote even wear over the operating life of the pumps. 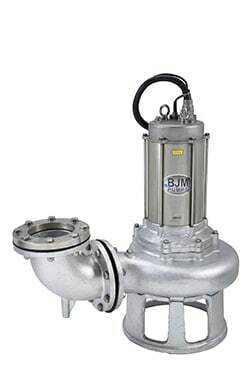 The superior construction and design features of BJM Stainless Steel pumps were a consideration when choosing the pumps for the application. Wear Resistance – All wear and “wet end” parts (parts exposed to the food waste) such as impeller, wear-plate, oil-housing, pump-housing and inner pump top are made of case 316 stainless steel material. Reliability – Three Seal Motor Protection –The submersible motor is protected by double mechanical seals. Lower seals are made of silicon carbide/silicon carbide and the upper seal is constructed of carbon/ceramic. An additional lip seal has been installed above the impeller to help prevent abrasives from entering into the seal chamber. Winding protection and (NEMA) Class F motor insulation allows the motor temperature to rise to 230°F, superior to pumps with Class A and B insulation. An automatic switch turns the pump motor off if the temperature and/or amp draw rises too high. Non – Clogging – The SKX type pumps produce a shredding action caused by a cutting impeller with a Tungsten Carbide Tip against a suction plate. The suction plate has an irregular opening with engineered cutting slots to help grab debris and aid the impeller with its shredding action. Volume and Lift – The non-clog, single vane impellers are designed for high volume and lift performance, perfect for the wet well application. Nestlé installed this triplex system in early 2013. After speaking with the plant engineer, Bryan Raftery, Kerr Pump’s Northwest Michigan’s Sales Engineer was informed that the submersible pumps were meeting expectations and BJM Pumps would be recommended on future applications. Since 2008, Nestlé has been using stainless steel submersible pumps from BJM Pumps at the plant. Nestlé’s high standards for processing healthy consumer products will continue to be matched by the latest innovations in efficient pumping through Stainless Steel pumps available from BJM Pumps. Kerr Pump & Supply launches new Web site, YouTube site, and Social channels – LinkedIn and Twitter.